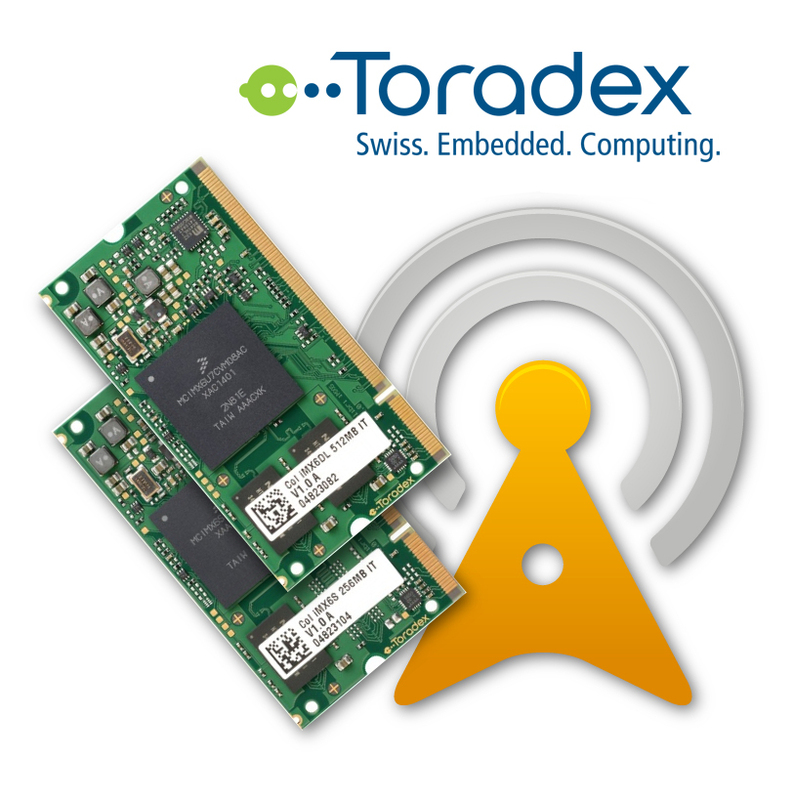 In this article we will be using the Colibri iMX6S with the base board called “Colibri Evaluation Board”, both of which, are from Toradex. 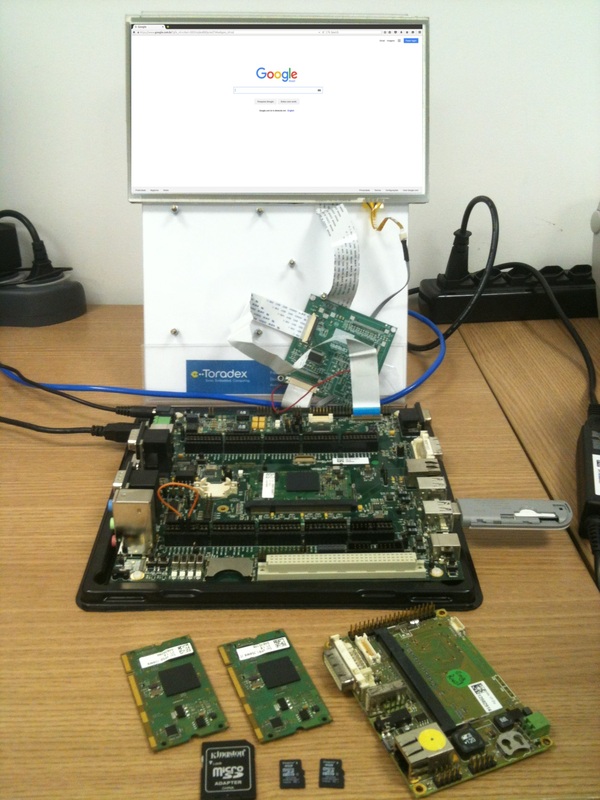 The Colibri Evaluation Board is recommended specifically for project evaluation and development. This product comes with a great number of interfaces like USB, Ethernet, I2C, SPI, RS242, RS485, CAN and many others. We can also find some multimedia interfaces like HDMI, LVDS, VGA and LCD already supported on the Evaluation Board. To follow this tutorial, you can use any USB or Serial modem to connect to the internet. You just have to adapt the interface created at “/dev/” and check the “AT” commands supported and implemented for your modem because each modem has specific AT commands. In this case, we have used for this tutorial a Huawei E173s 3G modem with a compatible SIM Card with data plan activated. To use the 3G USB modem through the PPP protocol, it is necessary to select some features in the kernel configurations and then compile the Kernel. To understand how to compile the kernel, I suggest following the link below. PPP (Point to Point Protocol) is a newer and better SLIP. It serves the same purpose: sending Internet traffic over telephone (and other serial) lines. Ask your access provider if they support it, because otherwise you can't use it; most Internet access providers these days support PPP rather than SLIP. Communication Device Class Abstract Control Model interface. Please read <file:Documentation/usb/acm.txt> for details. To configure and connect the 3G modem to the internet, Linux uses, in addition to the kernel drivers, a software which manages the connection. This software is PPP. Usually Toradex images already have the PPP software installed by default. After all the necessary drivers and software are installed, it is possible to check if the module recognizes the 3G modem. The modem interface should appear in /dev. Basically the driver simulates a USB connection as many serial connections. If the files ttyUSB0, ttyUSB1 … e ttyUSB2 were found, the modem was succesfully recognized by the system. In case you want to conduct in-depth testing, it is possible to use a serial terminal like “minicom” to start communicating with the modem and check if it is working well. In my case the modem had a baudrate of 115200. After validating the communication with the modem, it is time to create the configuration files responsible for connecting to the internet. You should be able to find a folder inside /etc/ called ppp. Some files need to be created inside this folder. In my case we use the PAP authentication file (may vary depending on Network Provider). Now we create the file responsible for sending the AT commands to the modem so it can connect to the internet. This file varies according to modem models/brands. Next we run ppp and analyze the log files. In the log files we can see when each AT command has been executed. Sent 3940 bytes, received 2843 bytes. You can validate the necessary command sequence to get connected using the serial terminal. Once it is validated, you can create your own customized chat script. Image 1: A running web browser using 3G connection. Another thing we can do is to associate our IP address to a host name. For this purpose, we used the NoIP services (www.noip.com). We then created a free account and added a Host. In our case, we chose toradex.noip.me. Image 2: NoIP Add Host page. In our case, when the 3G modem connection is restarted, we always receive a new IP adress. If we try to reconnect to the module, we no longer have access. A workaround was to use a method called Dynamic DNS(Dynamic Domain Name System). NoIP also offers Dynamic DNS services. Further information for using this method can be found here. Basically we send an http request to NoIP with information like IP, hostname, username and password. Image 3: Python Application Fluxogram. 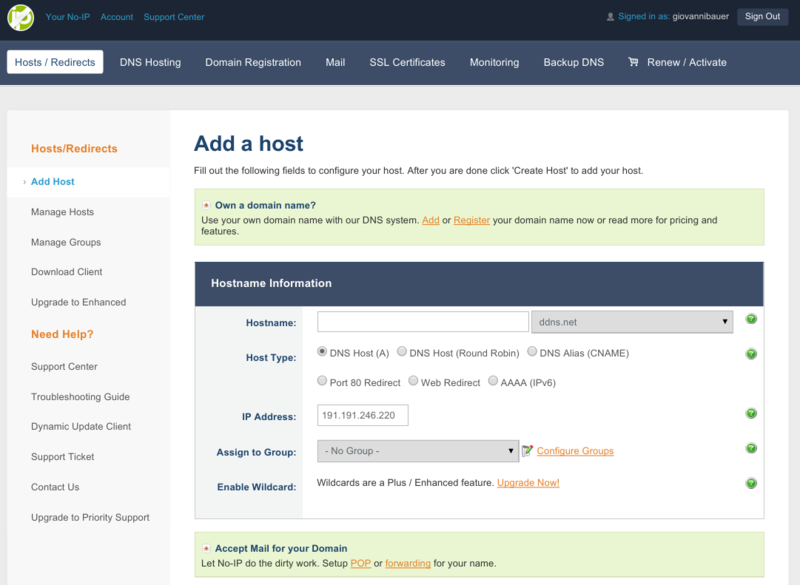 print myhostname, "is up and running!" print "Your IP", ip, "is still active, no change needed"
print "The given Host name", myhostname, "does not exist under specified account"
print "Please review your Host name and try again"
print "Login and/or Username incorrect"
print "Please correct your credentials and try again"
print "Sorry for the incovenience but we are experiencing some problems right now"
print "Please try again later"
After creating the Python program and making it executable with chmod +x, we can move it to /etc/ppp/ip-up.d/, which is a folder where scripts are executed after ppp connection or create a small script which calls our Python program. Inside /etc/ppp/ we have the files that we created at the beginning of the article as well as other files like ip-down, ip-up, ppp_on_boot. Feel free to explore each one of these files. ip-up is the script which calls another script or program found inside ip-up.d folder. toradex.noip.me is up and running! 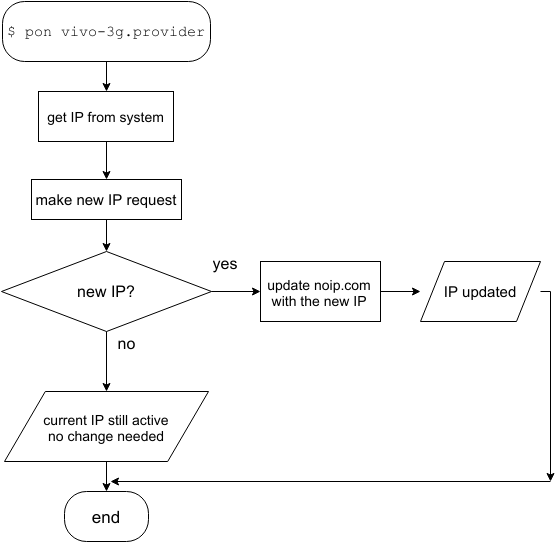 If everything is configured correctly, when we receive a new IP from our network provider, the system automatically updates our host created at NoIP, so it will be possible to connect to the module despite the IP address being changed. Apart from internet sharing, it is also possible to conduct port forwarding and many other network features. As seen in this article, a Linux system has many network functionalities. We just need to properly configure them and have access to ppp0 network. Another important point, is that regardless of the used interface, the programming method remains the same. The task of choosing the interface to use is made automatically by Linux depending on the routes. For those who require network connection in their projects and also need system flexibility, the use of Linux in embedded systems is the way to go. I like this article alot as it provided the essential points in setting up a 3g/4g modem beacuse generally people will mess it up or look for a tutorial up on youtube never to give a thought what they were doing wrong. its a very helpful article, thanks for sharing it. Thanks for sharing it.I used SIM800. My module ran. I have a question: how do i make a call or sms? I want to use internet and call together. Each module has its own configuration. As far as I remember from the modules I worked on in the past, if you use UART modules, you can just use internet or call/sms. For the USB modules, I remember it emulates more than one UART channel (ttyACM0,1,2...). In that case, it was possible to use one UART to the ppp and the other to send some AT commands. Using the correct AT Commands you can accept calls, receive, and send SMS. Again, it really depends more on what GSM module you are using.